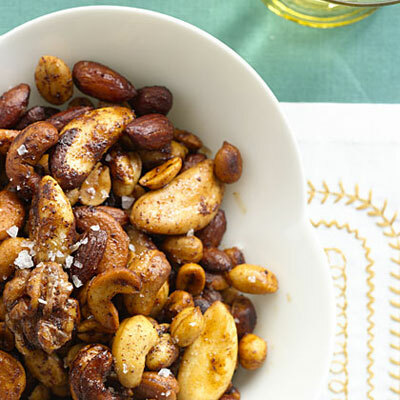 The holidays are the perfect excuse to make my absolute favorite treat in the world: Sweet and Spicy Nuts. I am nuts about nuts. So the holidays are the perfect excuse to make my absolute favorite treat in the world: Sweet & Spicy Nuts. These delicious treats are heart-healthy, rich on antioxidants, insanely easy, and make a gorgeous and very welcome hostess gift idea. As a bonus, they are pretty budget friendly (especially if you have lots of nuts left over from gift baskets). This recipe is very forgiving. Feel free to mix and match nuts, sweeteners, and spices. Heart healthy munchers will want to omit the butter and salt to keep fat and sodium levels down. Preheat oven to 350°. Coat a baking sheet with cooking spray and bake 1 1/2 cups nuts for 10 minutes; remove to cool slightly. Heat 1/2 cup maple syrup in a saucepan over medium heat, stirring constantly; bring to a low boil, and stir in 1 tablespoon butter. Add nuts, and stir until coated; let cool. Combine 1 tablespoon cinnamon and 1 tablespoon chili powder (less if you don’t want it spicy) in a bowl. Remove nuts from the maple mixture with a slotted spoon, and toss in the spice mixture. Lay nuts on a baking sheet, and sprinkle with a little sea salt; let dry. Store in an airtight container for up to 10 days. It makes 12 servings (serving size: 1 ounce).